Welsh cyclist Luke Rowe does not want to compete on the track at next year's Olympic Games in Rio. 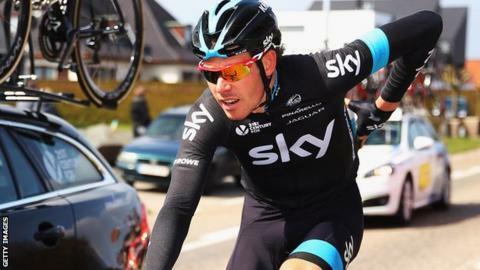 The 25-year-old was eighth in the Paris-Roubaix and helped Chris Froome to third at the Tour of Romandie. British Cycling's technical director Shane Sutton wants Rowe to be part of the pursuit team in Brazil, but Rowe favours the road. "I'll stick with what I know and where I love which is the road for the time being," said the Team Sky rider. "I think if I was to go on the track, it doesn't really inspire me that much." Team GB won the team pursuit gold at London 2012, and Sir Bradley Wiggins has already confirmed his intention to compete for track gold in Rio. But Rowe would rather focus on outdoor racing on the road than inside on the track. "We spoke about it and they [GB Cycling] said they wanted me to start training with the squad and getting down to Manchester and really focus on the team pursuit and the track for Rio," added Rowe. "But I think you've got to do what makes you happy and go where your heart lies. "For me, my ambition and love for the sport lies with the road and not so much the track. "Unless you're 100% committed to these things it's just not going to work. "It's not a no for Rio and the Olympics, but it is a no for Rio and the Olympics on the track. "I definitely want to go to Rio and represent my country in the road race, for sure that's an aim of mine, just not on the track." Cardiff-born Rowe is hoping to win a place in Team Sky's line-up for the Tour De France, which starts on 4 July. He said "I think I've done everything I could so far. It's just about going into every race, committing 100%, being loyal to the boys, putting it on the line and doing all I can. "If I make it I make it," added Rowe. "But if I don't make it I want to be in a position where I can say 'you know what Luke, you couldn't have done anymore'. "I'm just putting all my eggs in one basket trying to get a place in the Tour team, but you know if I don't go I don't go. "There's plenty more races throughout the year, there's plenty more years to get selected so I won't lose too much sleep. "But for now, that's where my heart's set."